Freedom Riders was founded in 1978 when three volunteers hosted a pony ride event for children with disabilities on the grounds of McKay Dee Hospital. From this, we've grown to over seventy volunteers meeting once a week, during the summer months, at the Weber County Fairgrounds. 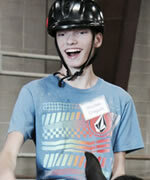 Freedom Riders is a non-profit recreational equestrian program specifically designed for physically disabled children. Freedom Riders uses well trained horses and specialized equipment to provide balance, coordination, endurance, and improve ambulatory skills to children with cerebral palsy and other physical challenges. These children, with the help of many dedicated volunteers, meet each week during the summer months to learn horsemanship skills as well as stretching exercises and games on horseback. The physical benefits of therapeutic horseback riding have been recognized for centuries. The physical impact of the horse's gait on the body improves function of the rider's pelvis, spinal column, joints, muscles, and even internal organs. The emotional and social benefits are equally important and beneficial to the children. Freedom Riders give the opportunity and the challenge for the disabled rider to savor their own personal victory by gaining self esteem, communication, self awareness, and the expression of feelings. Best of all, it is a thoroughly enjoyable experience which creates a special relationship between rider and horse and promotes personal challenges. Freedom Riders follow Path Intl. requirements and guidelines for equipment which include the requirement of a riding helmet and securing an area used only for helping participants mount their horse. Volunteers are given a training course and participating horses must pass a test before they are allowed to be used in the program. Our equipment is specifically created for programs like Freedom Riders that help children with handicaps. Most children have the opportunity to hike up a mountain, ride a bike, play ball, run and experience new and different things in their lives. Many disabled children do not have these opportunities. The volunteers in Freedom Riders are helping to change this. These children are able to feel a sense of freedom from their disabilities. Their spirits soar when they are on the horse. They are having fun while strengthening their muscles, improving their balance and flexibility and even learning horsemanship skills. property of The Freedom Riders Inc. Copy or use of any artwork contained in this site without the artist's permission is a Copyright Infringement.